Congratulations to "Chrisbails", the winner in Peggy's giveaway. Please contact JUST ROMANTIC SUSPENSE to claim your prize. 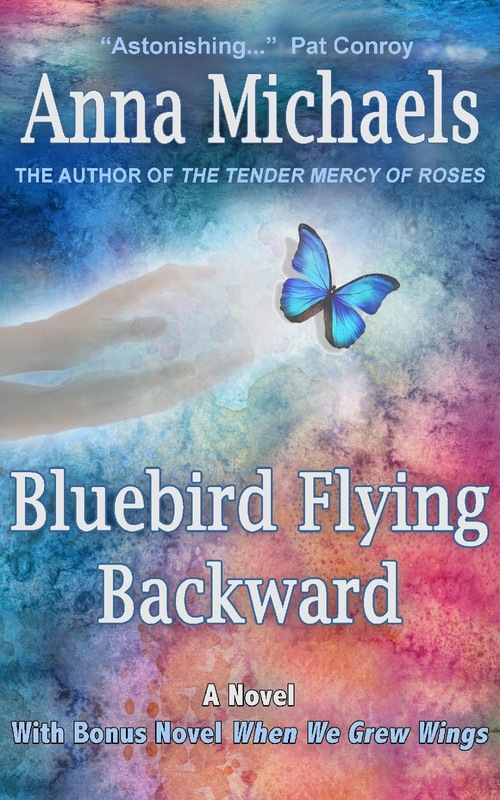 I’m so excited to share the news that my new historical suspense novel, BluebirdFlying Backward, written as Anna Michaels is available today! Bluebird comes on the heels of reader favorite BREAKDOWN, the contemporary suspense series I wrote in collaboration with three of my most beloved friends. Why the genre and name shift? I hear that question a lot, and the answer is neither short nor simple. Perhaps the best explanation for why I write in so many genres is that my own reading habits are wide-ranging and I’ve been writing for a very long time—thirty-four years, to be exact. Change was inevitable. I devoted the first ten years to romance, primarily comedies. As my stories began to outgrow the genre and I began to chafe at the confines of that market, I spread my writing wings into other markets…and took another name, two in fact, to identify those books as different from my usual fare. When you see Anna Michaels on the cover of a novel, you will know that you’re getting historical suspense. You’re going to plunge into a sprawling, complex story set against a specific historical backdrop that will be interwoven with the fictional story. You will also know that the story will be suspenseful. Sometimes a heinous crime—murder, kidnapping--is at the heart of the story, as in Bluebird Flying Backward. Sometimes the suspense is more subtle, as in When We Grew Wings, the full length bonus novel that comes with Bluebird. I love writing. I love tapping into a flow of words that sometimes spills onto the page like a river gone wild. Historical suspense novels allow me to swim in deep water, to fully explore every nuance of character and story. They also allow me to dig into history until I discover a thread I can weave into a novel that seamlessly blends fact with fiction. Bluebird Flying Backward grew out my research into the Lindbergh baby kidnapping of 1932. When I discovered a little known fact (telling would be a spoiler) that led me back to another horrific event in 1925 where several of the victims were known but one was unknown, I knew I’d found a story I had to tell. Writing this novel was pure joy! Bluebird will take you from the Jazz Age to the Lindbergh baby kidnapping. It will take you into the skies with Lindbergh and my female protagonist, Riley ‘Sam’ Samuels, an independent woman far ahead of her time. It will pull your heart strings and keep you turning pages. Fact and fiction are interwoven so closely, it might leave you wondering who is real and who is not. Most of all, I hope it makes you want to tell all your friends to get the book…and then leave you holding your breath till the next one. Crossing the Jordan, I think. Visit my website and sign up for my newsletter to learn more. A big thanks to Maureen A. Miller for hosting me and to you for stopping by. Leave a comment for a chance to win a lovely mug designed especially for me. I’d love to hear from you. Peggy Webb is the USA Today bestselling author of more than 90 novels. The Mississippi author loves gardening, playing piano and singing in her church choir. Visit her at www.peggywebb.com and follow her on Facebook and Twitter. Giveaway ends 11:59pm EST January 9th. Due to GDPR regulations you no longer need to submit your email address in the comments. If you have been selected as a winner your name will be posted at the top of the post. You may then contact maureen@justromanticsuspense.com to claim your prize. Your email address will be shared with the author/publicist providing the giveaway. Maureen, thank you so much for hosting me...and thanks to readers for stopping by. It's a pleasure to be here. I look forward to chatting with everyone who comments. Good luck on the giveaway. Wow the book looks interesting Great cover. New to me author I can't wait to check out. The colors of your new book cover are beautiful! Jan, thank you so much! Those are some of my favorite colors. I hope you like the content, too! Thanks for stopping by. The research would have been fascinating. An interesting time period. I love the title too. So excited about the new book - loved The Tender Mercy Of Roses! Suspense was my first love in books. Historicals came later, but are still as much of a favorite. I am glad to see more historical fiction books coming out that deal with 20th century events. Pre-WWII is far enough back that it is history and offers such a rich field to draw from for stories. BLUEBIRD FLYING BACKWARD sounds like it will be an interesting read.